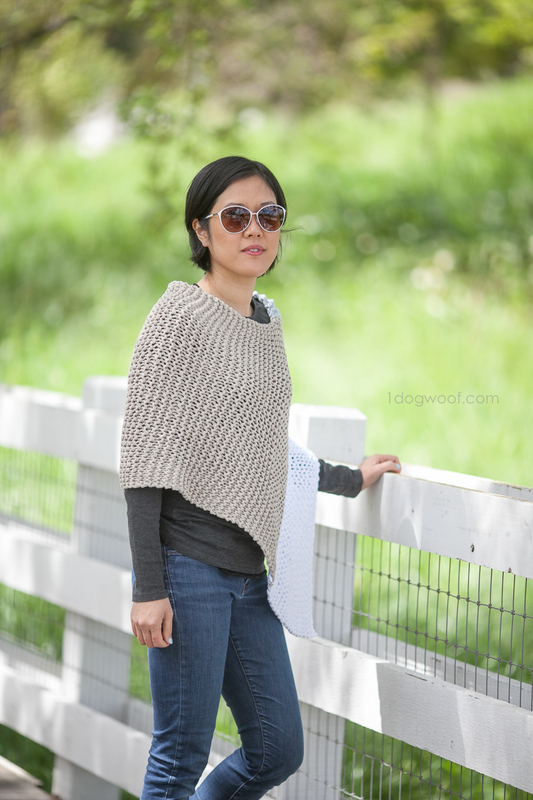 You know, I’ve never really been convinced of the whole poncho fashion thing, but now, here I am, sharing my very first knit pattern for my modern and easy knit Catalunya Colorblock Poncho, using Lion Brand Fast Track yarn. Go figure. 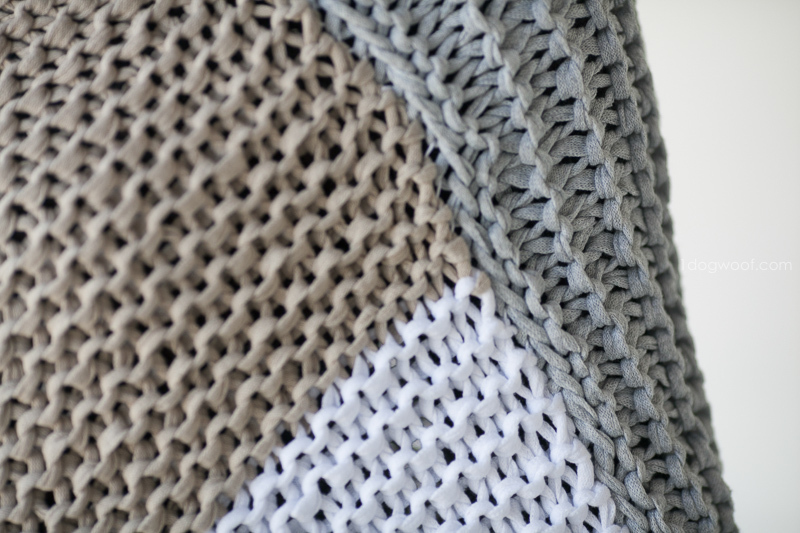 I had received samples of Lion Brand’s Fast Track yarn, and although the natural inclination is to use this sort of fabric yarn for home decor, I really really loved how Alexandra used hers for a garment, making me want to make a simple modern garment too. Considering how the yarn is cool to the touch, and has such a reassuring weight to it, it was bound to be comfortable! Instead of over-designing something which I’d have to frog 5 times, I decided to just pick up the yarn and go, que sera sera. I used a pair of size 17 (12mm) fixed circular needles from Knitters Pride, and cast on 40 stitches in the Chopper Gray. Then I simply knit every row! It was nice not to have to worry about tension differences between my knit and purl stitches, and I didn’t even have to count, since all the stitches were the same! This was great practice for keeping my knit stitches at a consistent tension. I like to slip the first stitch in each row, as I read that it keeps the edges a little neater. When I got close to the end of a skein, I finished the row, and started the next row with a new ball and new color, with very little regard as to how the colorblocking was going to work out. I kept draping the “fabric” over my shoulders to get a feel for the sizing, and when I finally blocked the piece, it came out to a nice even 2 ft wide by 4 ft long, perfectly fitting on my foam blocking boards! I had used a few yards of the gray on a small basket (made a few more planter covers! ), which is why there seems to be less gray in the picture above. The taupe section was the full skein, and I stopped short on the white yarn, since I have a tendency of making everything too large. The weight of the yarn will stretch out the garment, so it’s better to make items a little bit smaller than you think. 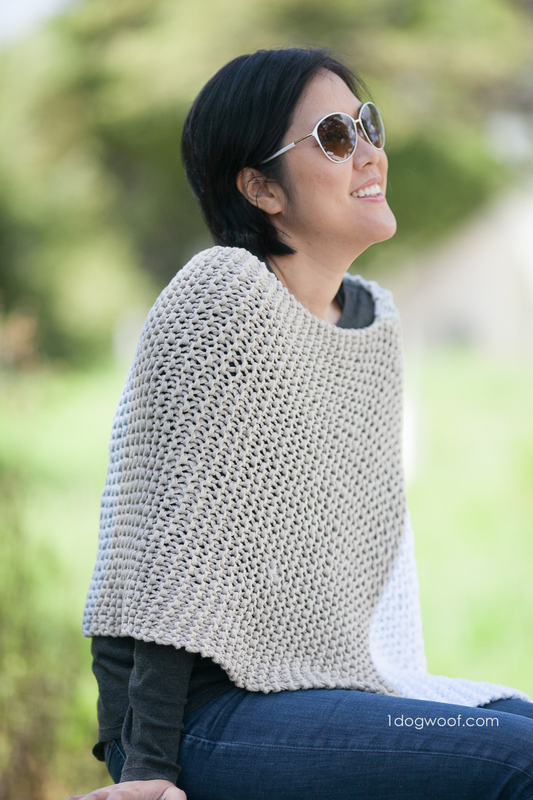 The poncho’s unique shape is created by attaching one end of the rectangle to the far side, instead of attaching the ends together to make a tube. I chose to let the white color block be the main focus here, for two reasons. First, I like white. Duh. Second, I found that I must have knitted the gray section a bit looser, or the yarn was slightly thicker, because it stretched much more than the other colors, so I sewed up that end to make sure it didn’t over-stretch. Since the ends were 2ft, I measured 2 ft along the side of the work and added a stitch marker for pinpoint the start and the end of my seam. 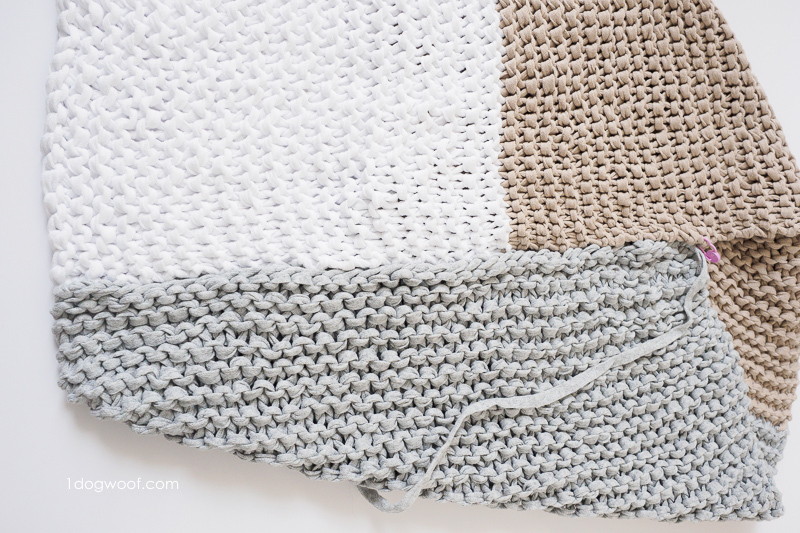 I used a simple mattress stitch to attach the gray end to the side of the white color block, and instead of using more Fast Track yarn, I used white crochet thread. I think whatever you use will be fine; I chose the thread pretty arbitrarily. Once all the ends are knotted securely and woven in, you’re done! I normally take my own photos, but this time, I was lucky enough to work with my friend Meghan from Jeune Girl Photography. We met on a gorgeous spring day, in a gorgeous local park, and she took these gorgeous photos. 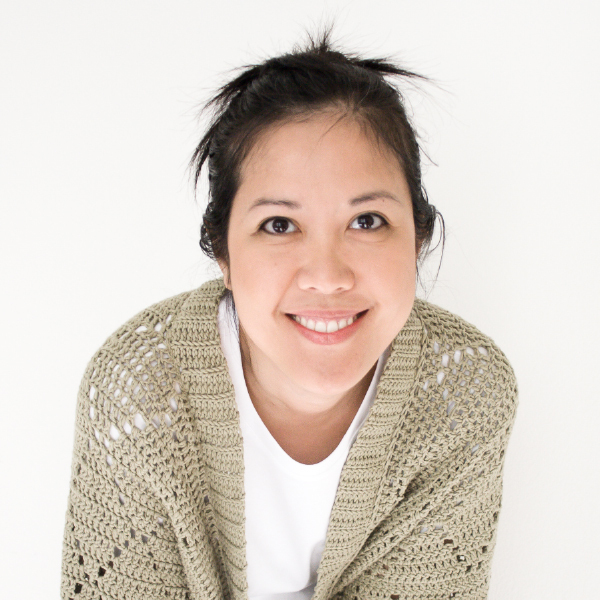 If you’re local to the San Francisco Bay Area and need a photographer, go check her out! 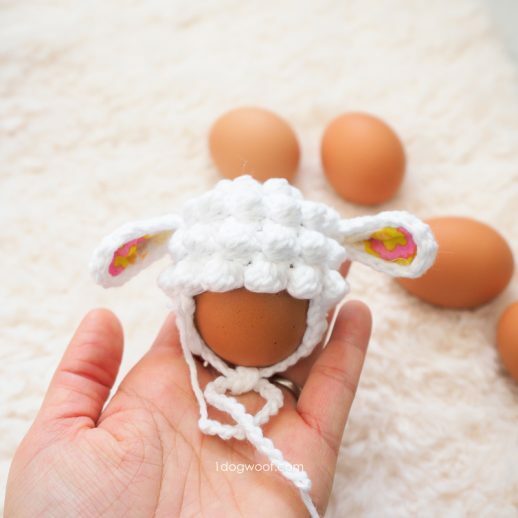 She also makes finished items from my amigurumi patterns, so head over to her Etsy shop if you’re looking for a custom gift! 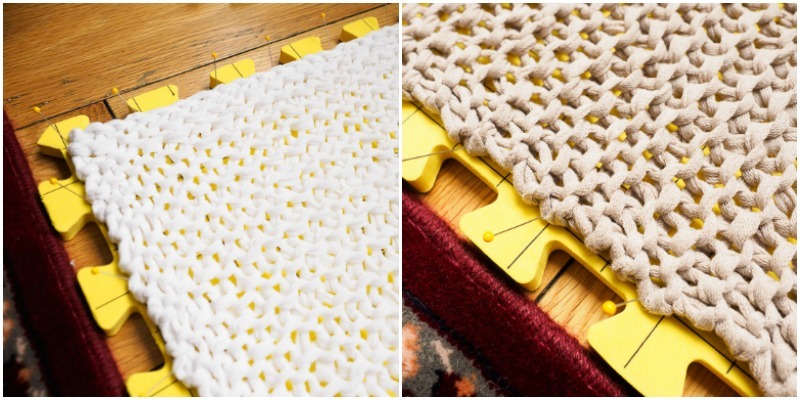 Overall size: When blocked, the rectangle is 4ft long by 2 ft wide. Once sewn and draped, the size will vary. This should fit Small and Medium individuals. Larger sizes may need to increase the rectangle by a few inches on either side. The width of the rectangle is the length of the garment. The length of the rectangle needs to be draped around the shoulder to determine the collar opening. 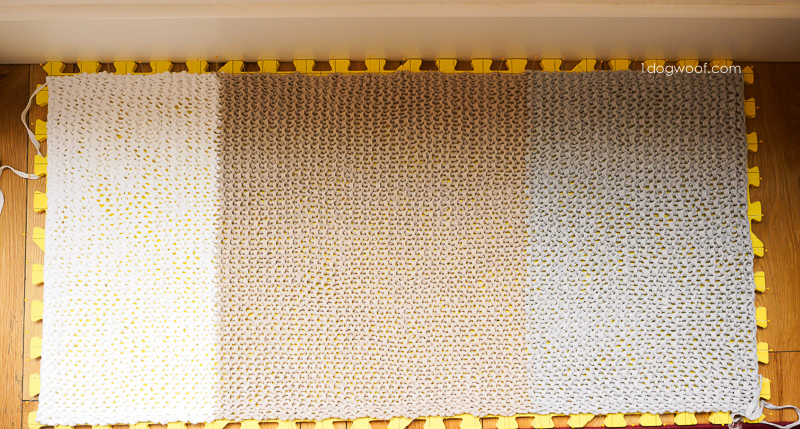 The size of each color block is arbitrary and can be changed depending on the length of yarn available. Row 1: Slip the first stitch. Knit 39 to finish the row. Row 2-47: (or until color A runs out): Repeat Row 1. Row 49-117: (or until color B runs out): Repeat Row 1. Row 119-153: (or until color C runs out): Repeat Row 1. Block your work to approximately 2ft by 4ft. Measure about 2ft along the end side of your work, by color C, and mark the length with a stitch marker. Making sure not to twist your work, align the beginning end (color A) to the section you measured off, sew the beginning end (color A) to the long side by color C.
Tie off all yarn ends and weave in ends. This project will forever be my “Escape to the Country” poncho, since I binge watched that show on Netflix while making it. It was so nice to not have to worry about stitch counts. That way, I could focus on crying over how much I could buy in rural England for the same cost as a townhome here in California! 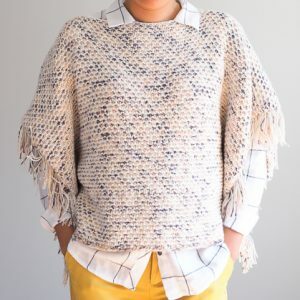 If you make a Catalunya Colorblock Poncho, share your work with me on Facebook (One Dog Woof) or Instagram (@1dogwoof)! You can tag your post with #catalunyaponcho and #1dogwoof. Enjoy! Hi! May I know why the shape comes out as rectangular when you used the circular knitting needles? Sorry, not very familiar with knitting. I don’t join my work, so I use my circular needles like really really long straight needles 🙂 The extra length is great for holding all of that extra length without needing gorilla arms to hold it all up! I really like the colorblock and the modern look of this peace, and your photos are beautiful. Could you please add one of the back, though? It would be very helpful to see exactly how the back falls when worn. Thank you! 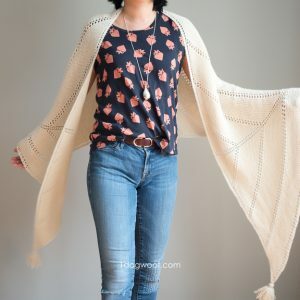 The back of the piece is shorter than the front, and it looks like the back of a shawl when draped over your shoulders. Does that help? I am having trouble with the yarn twisting. Is there a way to hold the yarn so it doesn’t twist? Or does it not matter if it is twisted? Hi – saw this pattern and loved it! 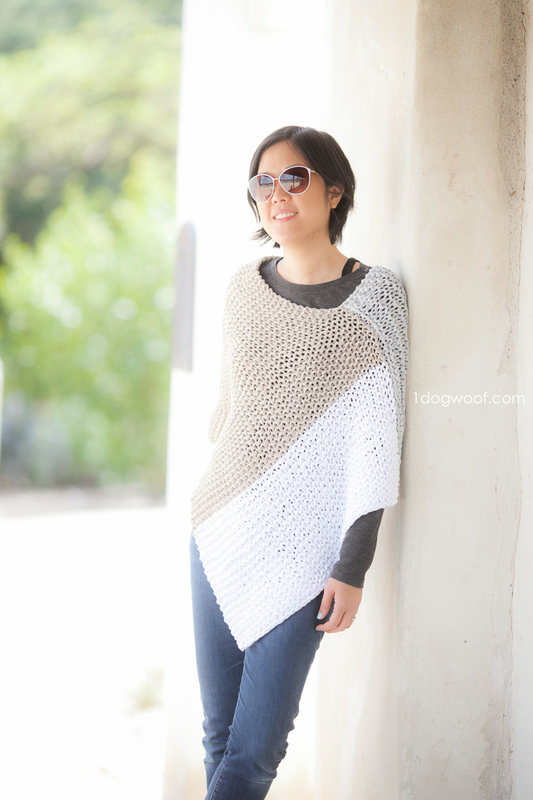 I’m an “advance beginner” knitter so this seems like a great way to make my own poncho. Quick question: I’m a plus size (16-18). I just cast on my 40 stitches to get started and it seemed like it might not be roomy enough for me. I understand the Fast Track will stretch a bit, but any guidance on how to increase the size of the poncho? Should I cast on more stitches? Or make each of the color blocks longer? 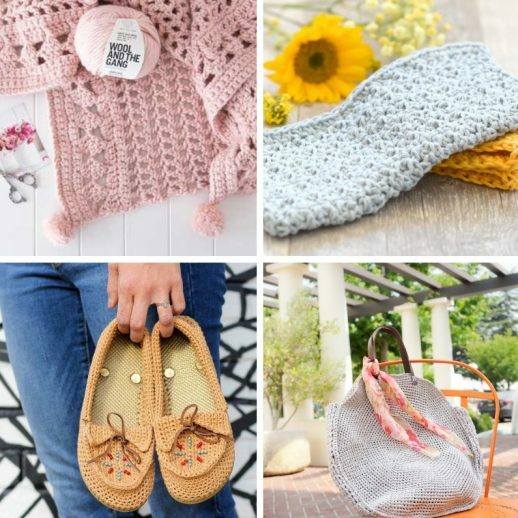 Thanks for your help and keep sharing these great patterns! I’d like to know this, too. Thanks. Long story, but I FINALLY finished this project! (Yes, that’s me above. I started last summer!) While I love the color block (and have made two for gifts), I made this one for myself in all black. I experimented with the sizing. I ended up casting on 50 stitches and made the length about 48 inches (unblocked/unstrechted). This worked out great for me — I’m 5’6″ and wear a 16-18. Because it is all black, I felt like it needed something a little extra so I did put fringe on… but it would have been fine without it, especially if using different years for the color block. It took me three tries (thank goodness the yarn is forgiving to pull it out – no problem if it twists), but this combination worked well for me. Hope this helps other plus sized ladies… good luck with your project! I just have a question about the instructions. On rows 48 and 118, you say switch to next color. Then you say follow instructions for row 1 on rows 49-117 and 119-153. But are rows 48 and 118 the same as row 1 also? I usually join my sections so I just wanted to be sure. Thanks! Did you receive a reply to your question? I to have the same question and I noticed that there were a couple of questions that we’re not replied to and I would like to know the answers to those as well… If you happen to get a response or no the answers, will you please share them? I am having difficulty with gauge. I went to larger needles and I am still not anlw to get your gauge. Is anyone else having this issue? I am at least 2 inches short! Hi! Absolutely LOVE your things and am amazed at your creativity and your kindness to share the same! Thank you. I too would like to know how to make the pattern larger…say enough to fit a finished bust of 44. I am sorry if I overlooked your response to the one request already… Secondly, do you use a total of three skeins or is it three skeins for each color? I just finished the poncho. I’m not happy with how it turned out. The gauge was good but when I put it on it didn’t lay right. The neck was too wide so I put in a few more stitches to close it up. I just don’t care for this pattern. It looks gorgeous on you which is why I chose it but it lays very bad on me. 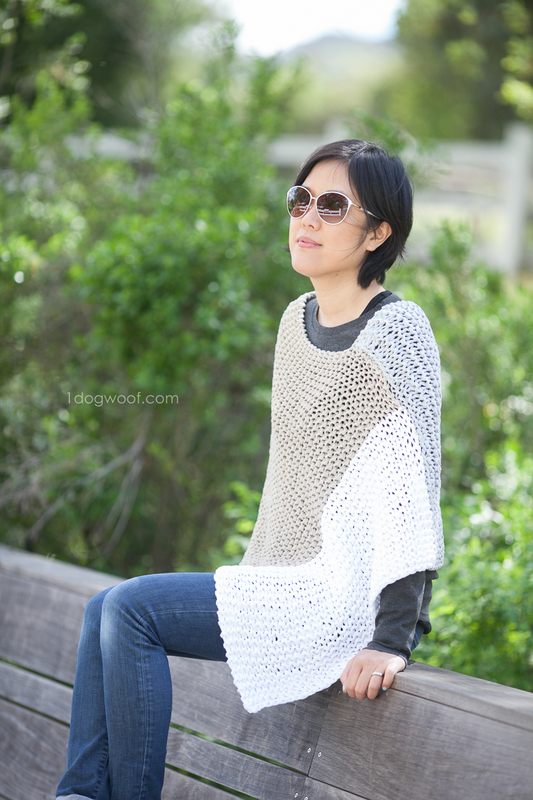 I really like the look of this modern poncho, but I don’t knit. 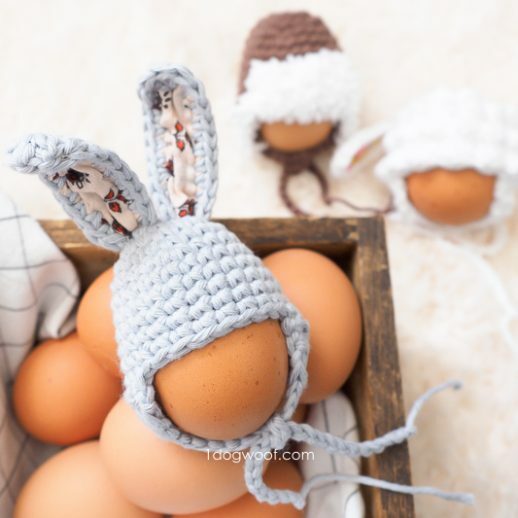 Do you think it I could crochet this instead? 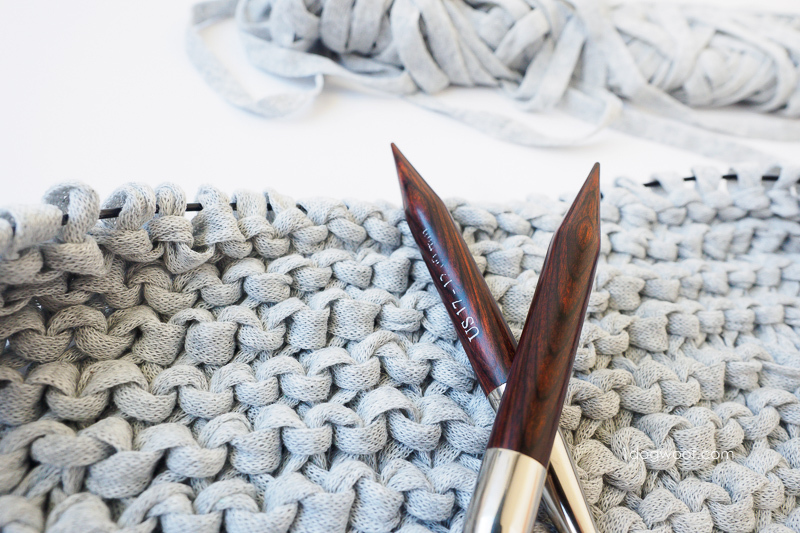 what do you think a comparable crochet stitch might be? I have been crocheting for 3 years now, so I don’t know all the stitches out there. Any advice would be great. Thanks.